A brief examination of the track list can hint that there is some sort of a personal family issue which serves as the foundations for this album. When I read about the story behind this release, I couldn’t help but raise an eyebrow at first due to the almost too personal (nothing is too personal these days, right?) information that was revealed to me, but the story does give, eventually, the proper context for the few songs that are placed between the long, warm drones in this album. Brian John Mitchell is the biological father of Andrew Weathers, who met him many years after he was sent as a baby for adoption. It is this meeting, which is naturally infused with deep emotions, that gave birth to this collaboration that proved, better than a DNA test, that drones are in the blood of both the father and the son. 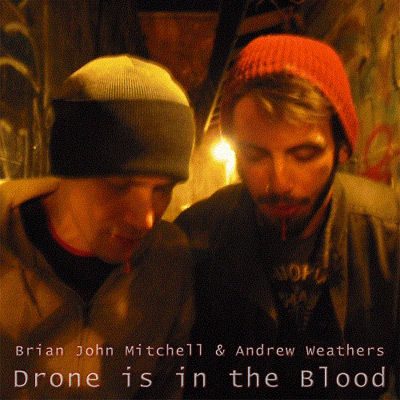 Once you listen to the entire album from Alpha to Omega, the songs that can be found in ‘Drone is in the blood’, with feedbacked guitars and naked singing, are more than waiting stations between the more bombastic drones. Some of these songs are indeed good, and they all revolve around the complicated Father Son issue that started this project in the first place. I think that the story that unfolds through the lyrics is also presented in a more abstract way through the soft caress of the droning clouds that surround the other half of the album. The closing part is the most powerful track on this album, showing sensitivity and pain through warm loops and feedbacks. Whether this is a one time project or the beginning of a long collaboration in these sort of music, ‘Drone is in the blood’ is an interesting point of reference, not necessarily to the specific story behind it, but to a distinct translation of an inner burden to a published work of sound.